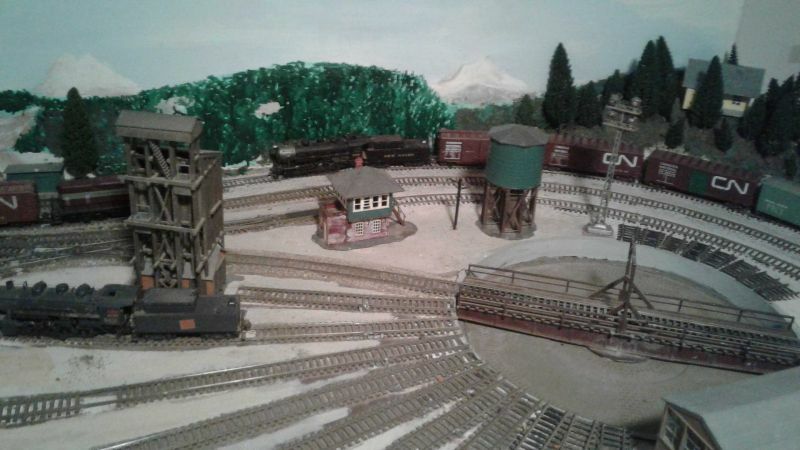 I have probably been conspicuous by my absence with a layout photo. 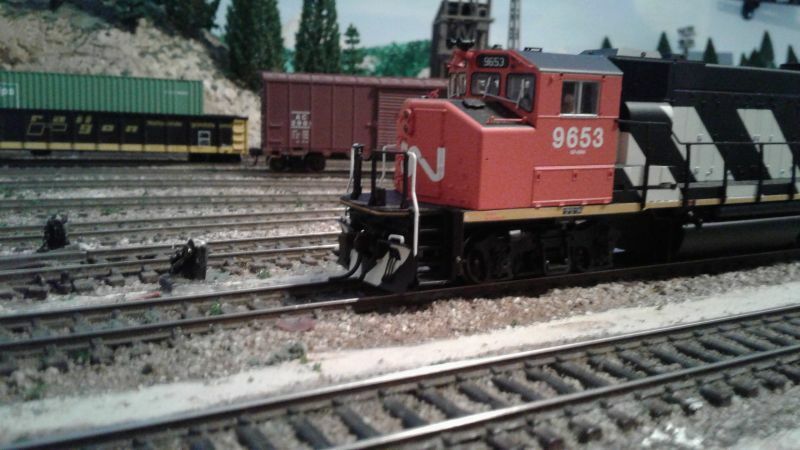 We have recently moved to Ocean Grove on the Bellarine Peninsula southwest of Melbourne and the layout had to be readied for transport down here and so was stripped of buildings, trees and anything else that could get damaged. While the layout has been in a stripped down state, I am using the opportunity to get to parts which needed a more careful eye that caused a little trouble at the back that I could reach but could not see properly. 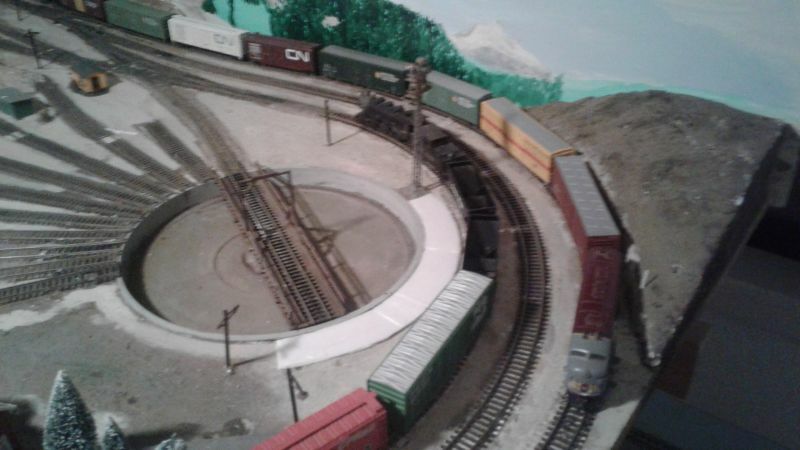 I did start as a project last year (before the move was even contemplated) replacing the curves on the layout with set track curves in a compound radius (nothing below 2nd radius curves) as well as playing around with superelevation of those curves. Hence the curves are not ballasted yet! Here is the main station which is actually a Pola kit from many years ago minus its base sitting on the new ground level platform. The Pola building is replacing the Atlas building that was there which will be relegated to the intermediate station(s) on the main line! I completed it tonight and have also lit it with LED's inside recycled from those within the old Atlas building. The glazing was done with PVA rather than the supplied acetate. The platform itself is foam core but it is layered with a very thin foam sheet that the foam core comes packed with that looks like asphalt gotten for free from the picture framers as they cannot recycle it in any way shape or form! A coat of concrete grey and one platform - actually two because I did the same thing with the other one! This pic is showing the basic hill with the first washes applied. It now looks darker but will update that shortly! Hope you like the views and I will keep this updated! Nice trick on the platform, I'll have to keep that in mind for myself. 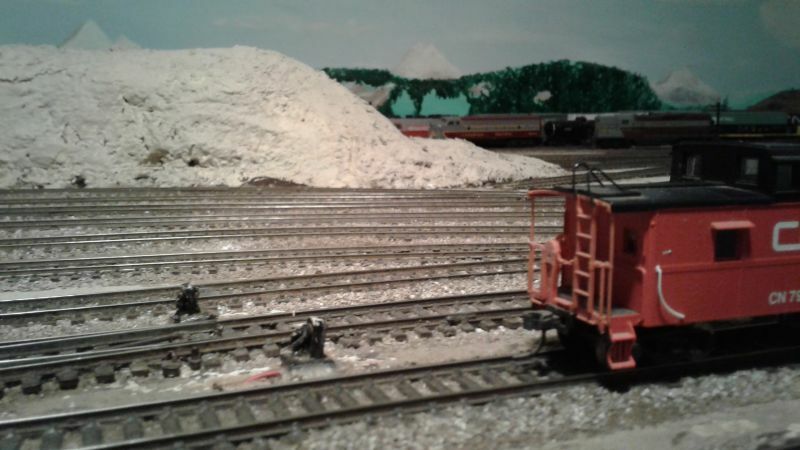 Also, great job on the snow, winter layouts like this look really neat! 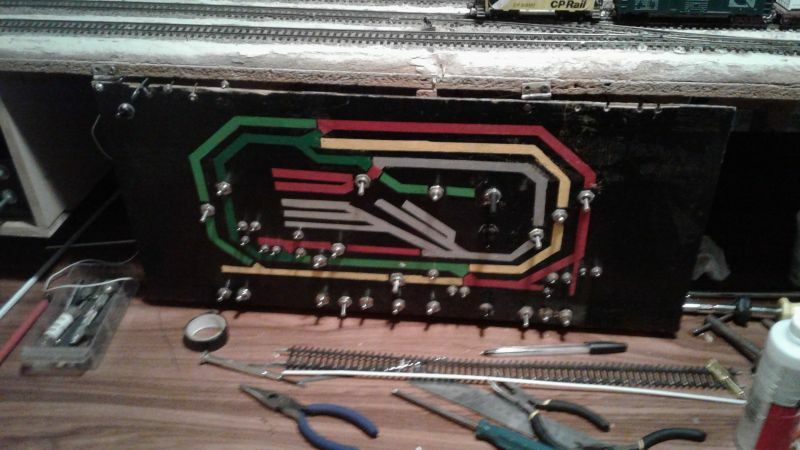 Last night I finished wiring up the Turntable roads. I had a rotary switch that was wrecked in the move here so it needed replacement which was done yesterday. The old rotary could rotate 360 degrees where the new one stops at 1 and 12 i.e. 330 degrees of travel. 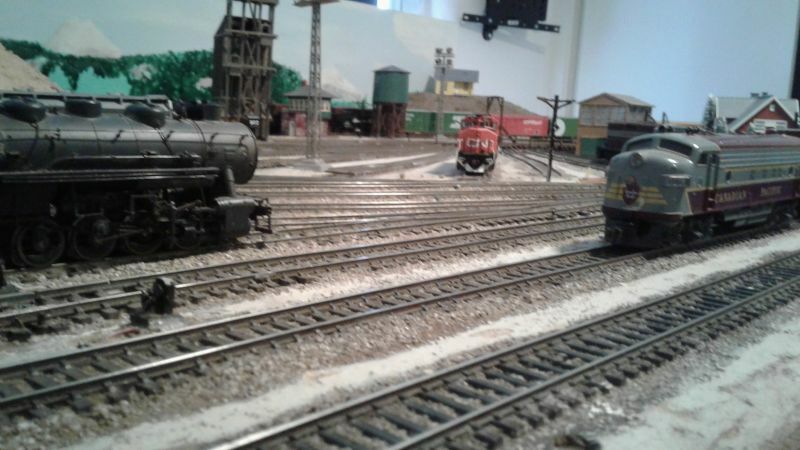 I have set it up so that the roads on the turntable equals the clock position e.g 1 road is at 1 o'clock on the rotary switch, 2 road is at 2 o'clock and so on. The knob on the control panel will have a pointer so it is easy to equate as it was back in our old house. 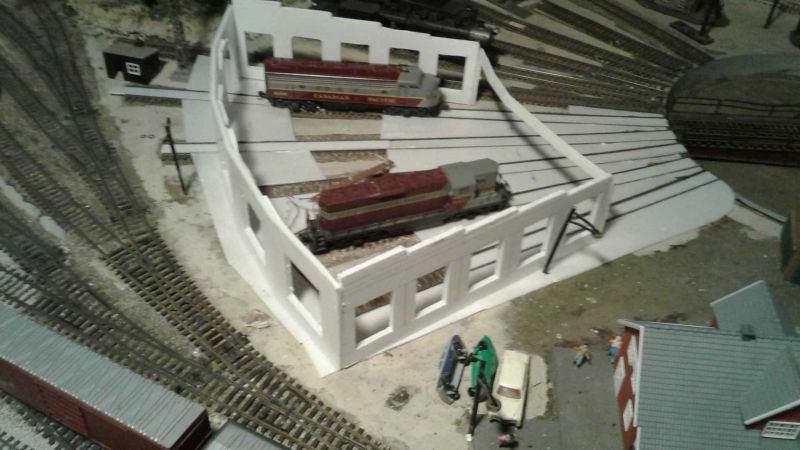 I have also used some of that scrap foam sheet to build up the track base so that unlike in the old house, there will be "over runs" available for each of the turntable roads protected by some form of track bumper - buffer stop to our British and European modelling cousins with a short length of track. Brendan, that hill is not snow covered and it will have vegetation when I am happier about the ground colour and texture. The colour of the ground by the loco is simply the ground tones I used as a base - this white bits under the tracks are the scrap foam pieces used to make the super-elevated curves of about .020" or so but on the 4 x 8 it seems enough! The painted hills in the background are snow capped similar to the New Zealand Alps in summer ... I have not seen Canada in the summer apart from pictures and I guess that some aspects are going to reflect my Australian heritage, such as the hill which reminds me of Broken Hill in New South Wales and the hillock to the south of the main railway station which as part of my work over 40 years ago, I went through quite often on the train! The built up surface ready for painting and track laying and ballasting. What a difference the day or two and the installation of a few structures makes! I have been glazing the up till now open windows with PVA glue and installing some buildings in what will be their (for the time being) final placement. 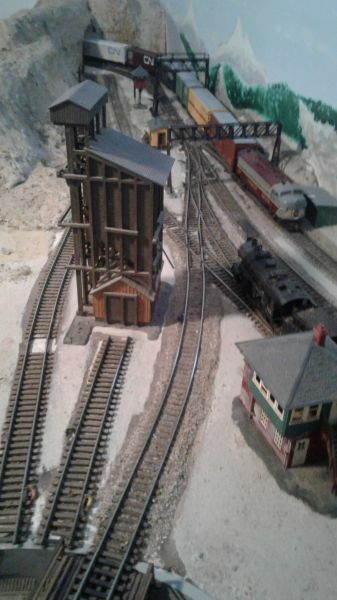 I am going to put in a new version (of which I have a kit to be done) of the signal tower and also the intermediate station (which I don't have a kit yet... yet) relocated from the end station(s). 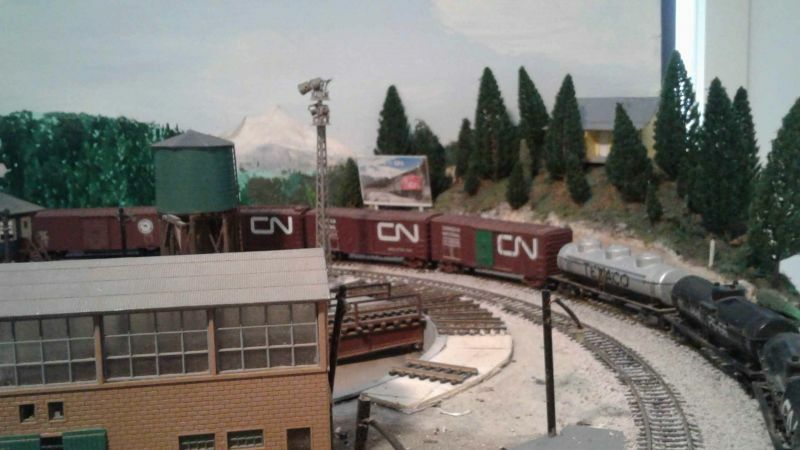 I am as yet not quite decided what to use for the soil and dirt colours on top of the hills and the areas not becoming a rail yard so perhaps any of our Canadian members could make a suggestion or two! Anyway here todays photos are... and I can do some stuff tonight as well! The signal bridges add to the dramatic effect. They are minus signal heads for now but they will be added in the fullness of time! The view from the drivers position for the main throttle. Where the wide nose CN unit is sitting in the loco area, there was a single unit engine shed in the area. 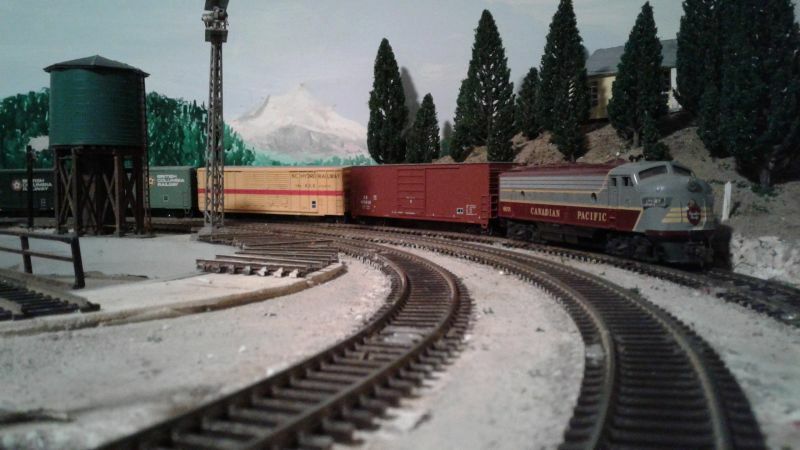 I am contemplating making a new loco depot to cover at least 2 or 3 roads as a servicing point undercover. More later and hope you are liking the views! The weekend was a fairly productive one... just not quite so much on the railway front! Oh Well! I had ordered a bunch of 20 trees on Ebay which I installed on the weekend so I ordered another of the same group plus some firs as well as some generic tree armatures so the layout will be well "treed" as it gets closer to "finishing" ... famous last words!!! You can also see the turntable overrun tracks which I will put in track stops of one kind or another. I had a very crude road bridge over this area that wound its way into the station, hence the gaps in the track stop areas until I work out the location of the bridge. One of the support piers wound up in the middle of track 10's overrun so that may indeed become shorter. 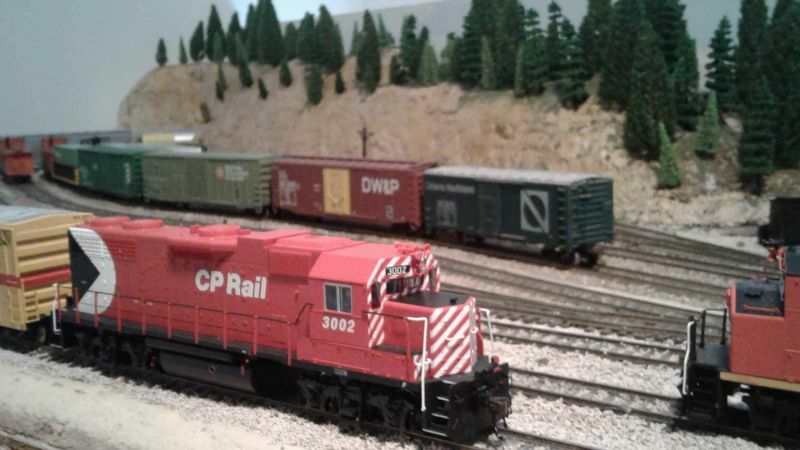 The next view is beyond the turntable showing yet another test train hauled by a CP GP9 with two USRA pattern 0-8-0's waiting their turn of duty! 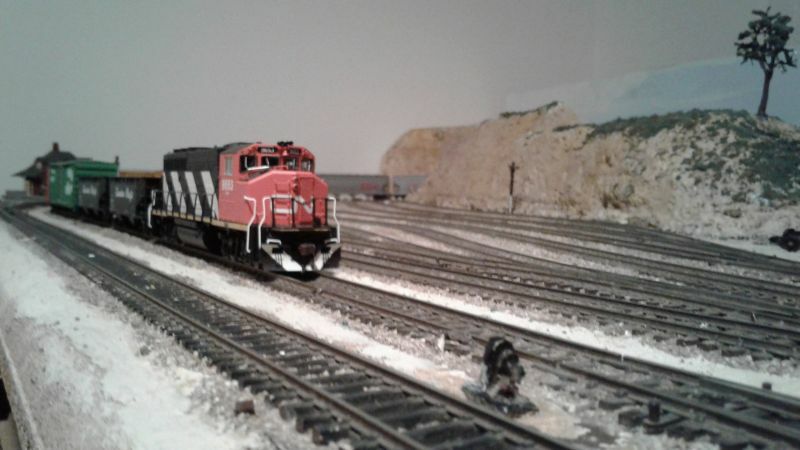 I deliberately picked the FP7 and the two 0-8-0's (out of my fleet of 20 locos on this layout) for test trains as they are the least forgiving locos of faults in the track work that I have. 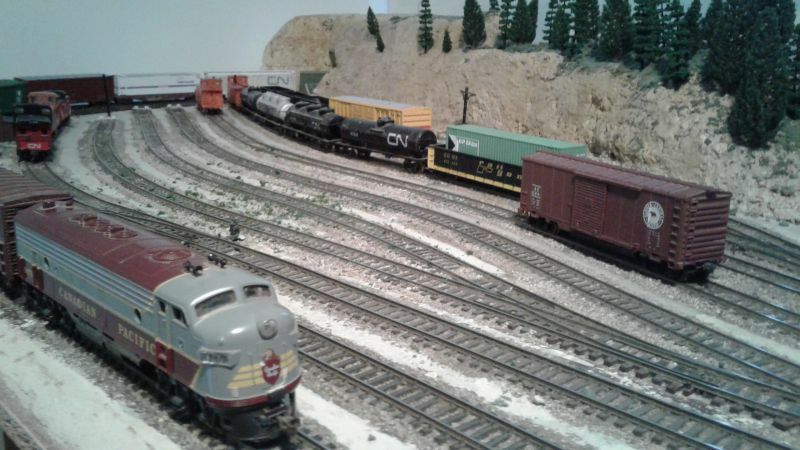 I have made sure that derailments are at an absolute minimum and I have tested trains in multiple directions, both pushing and pulling consists. 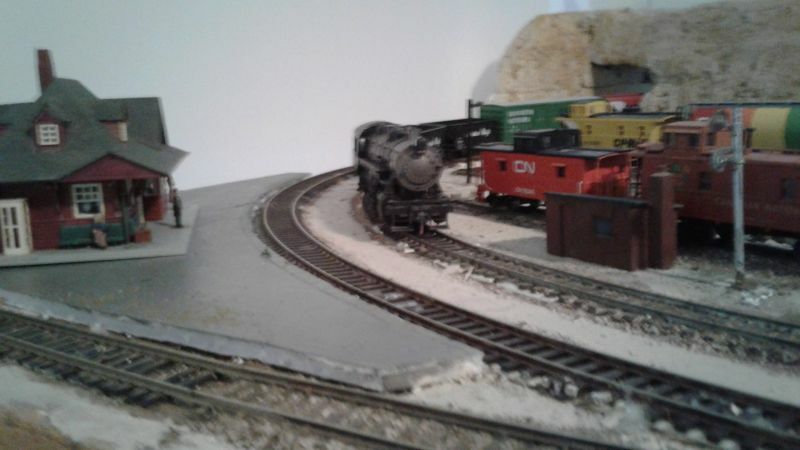 Having said that, I had many sessions on my own in the previous location where there were often no derailments or those which did occur were of human error... do you think that worked when I had visitors??? I will be interested to see how this performs with visitors and note whether the trains really do know you are trying to show them off! Glad to see this progressing! 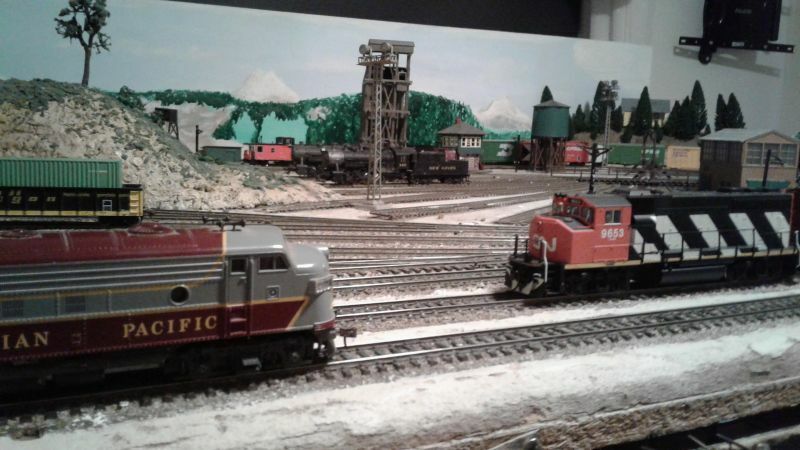 May I ask who made the USRA pattern 0-8-0s, and the turntable? The loco's are/were Lifelike now Walthers and the Turntable is a Heljan which I think was marketed by Concor in the States. I bought it about 35 years ago. I did have a motor drive on it but with that age and the extremes of the shed, the underfloor gear wheel disintegrated one day! I merely turn it by hand at this stage but motorising it again is another of the projects I have set myself ... at current rates about 2130! Today did not have much to show on a visual level but I now have all three of my controllers up and running! I use three controllers, two inertia controllers shown below on the left (walkaround version) and right ( and a straight controller. The power supplies are in the three cases. The wiring has to be straightened of course but part of the reason is that the cradle is deeper and wider than the previous version to hold some often used tools (not a soldering iron) for ready access such as uncouplers etd. The switches down the bottom on the inner loops are operating either the upper switches or the third controller while the ones for the outer loops turn those blocks off. 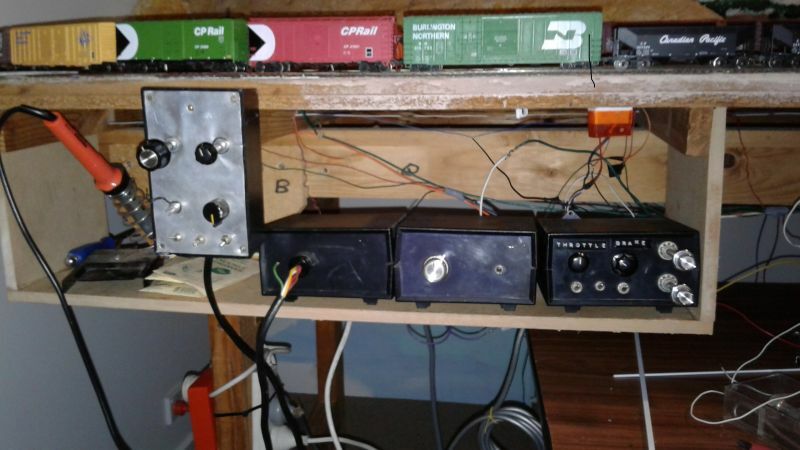 I could have used rotary switches and may indeed do a rewire further "down the track" (pardon the pun) when the Reginald Bridge/Vista Fiddle yard module is reinstalled. 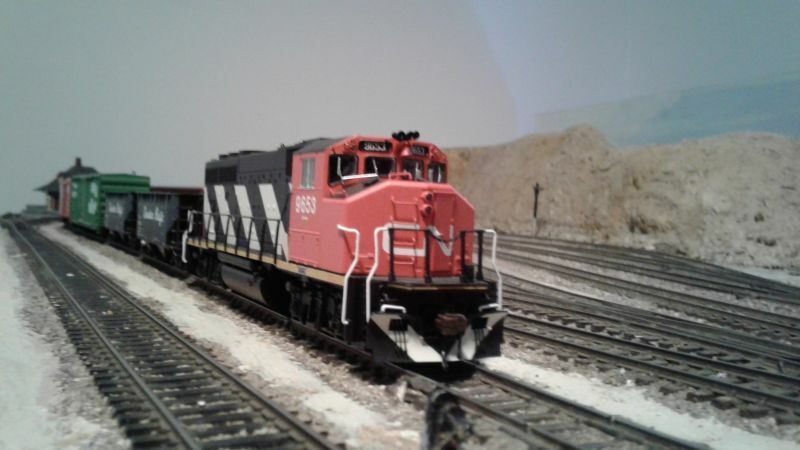 This enables me to run 3 locos at any one time. If there are any more than 3 locos being operated, the centre controller is not used and the bottom switches are all used as off switches. This has enable me to operate up to 5 locos in the same vicinity but only 2 at a time. The desk top is my old computer desk which I am now using as a work bench which conveniently rolls under the layout until I need it... which in the rebuild phase means 95% of the time! Hope to have more detail for you soon! The next task will be getting the back scene a little more presentable with tree textures and deeper colours for the "forested" areas! So I guess that won't show much progress either... oh well I am enjoying the journey anyway! Hi Trevor, looking great ! 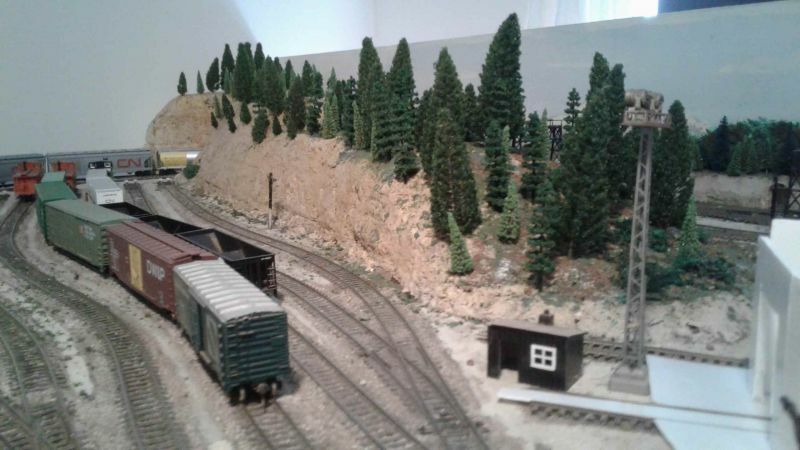 It's a pain having to strip down the layout for a move but it's given you a chance to look at and change any areas you weren't happy with not sure if this helps with the summer scenery or not but all I can say is you need more trees BIG trees ! Thanks for that... I had a number of pine like trees that have been around for a while which badly need "renovating". 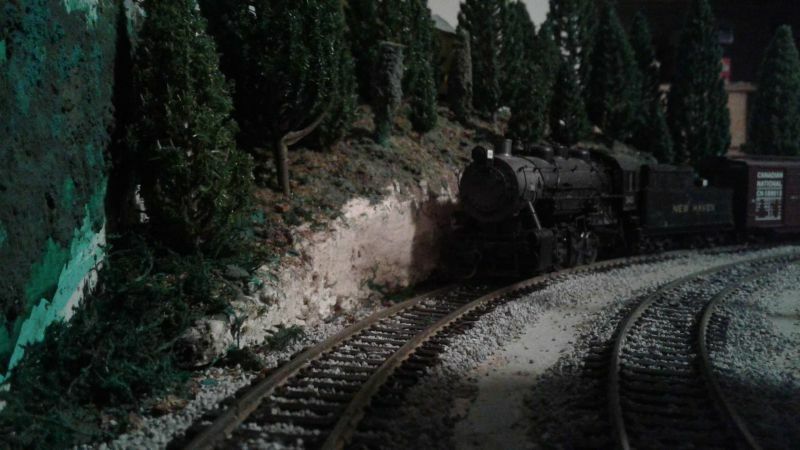 The layout itself is only a 4 x 8 so there is an issue with having things like trees etc overpowering the scene and making it "smaller" by virtue of scale... I know there is a coal tower there but the trees are such that they could provide a bit of depth perhaps by forcing a bit of perspective. Trying to get that balance right is a cause for a lot of thought but there is another load of trees coming like the ones you already see! Today I finally managed to get some acrylic matte medium... it seems to be like hens teeth in this area and it was on sale! I also got a foam block that I will grate down to make some grass and bush material before adding any Woodland Scenics stuff I have... haven't managed to find that yet! The next couple of photos are more of a "before" and "during" rather than a "before" and "after" as I am using some materials that I have not used before. The hill that you see here is after the washes of earth tones have been done. I have had a couple of different people through who liked the cliff faces and the dramatic effect... they are friends and I deliberately asked them not to "soft soap" with their critique. Fast forward to the move here, and I have had a bit of experience with ground foam and gluing to the surface but was a little stymied by perhaps a little bit of trepidation doing it on my own. I got the matte medium yesterday and the earth tone acrylic paints a while ago. Today I got a few different toned green florist blocks for a couple of dollars each so I have been busy with a file grinding them down to loose ground foam to give a couple of different toned greens. Following a you tube video in a way, I painted a small area on the top of the spur with some Raw Umber acrylic and spread some of the ground foam of the two tones I ground up on that. I was not totally happy with the result so I have painted some areas with straight matte medium and spread the “grass”. If anyone has used plastic tree armatures and ground foam, I would be interested to know what techniques you used but it was the first one! I will be relying in the mean time on the trees that are coming to fill in the scene with the armatures as fill in trees! Just an update as there is not much physically to show but there is a lot to be reported. 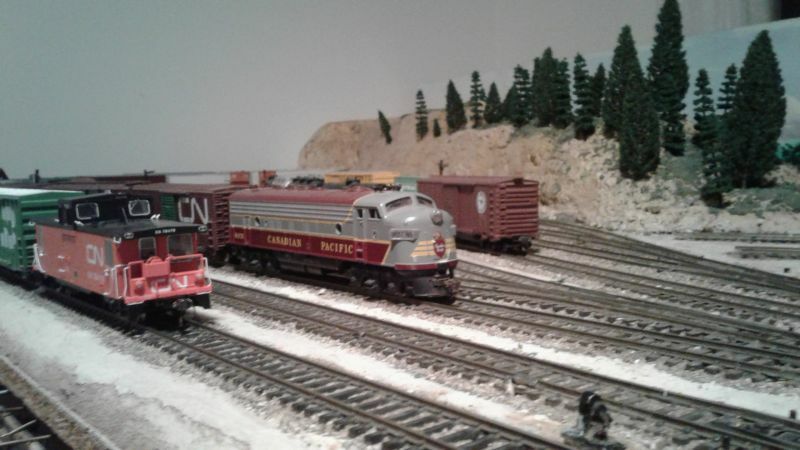 The troublesome sections of track were relaid today and fairly heavily tested so that the FP7 (The Canadian Pacific F unit) is negotiating the track work quite well and with full loads of up to 14 freight cars plus a Van (Caboose to anyone outside of Canada). It could probably haul more but that is my limit! Part of the issue was that the track was secured with an issue and consequently undergauge ever so slightly. The FP7 and a couple of vehicles would not negotiate that area more than a couple of laps without tripping as well as an area out the back. Every thing else bar those vehicles would travel through with no issue. The FP7 also had an issue found today with an under gauge wheel set. Today was spent relaying the track in that area and repositioning the super elevation spacers then securing it to the base. Now that I am satisfied that theI running issues are solved, the track has been glued down. The before and during photos have not been completed yet as the new trees have not arrived! I have tea leaves drying out to provide an effective brown ground cover, but I need to make sure the odour is not going to be an issue. Visible progress is slow! I think it will be doing a bit of ground foam work as well as a few auxiliary light and signal connections ... why is it taking much longer than it was to take it apart???? Notice that the station is both glazed and removed from its base after more than 40 years in two states and three locations! This was the site where the AIrfix booking hall was the intermediate station but I think this one looks more the part! 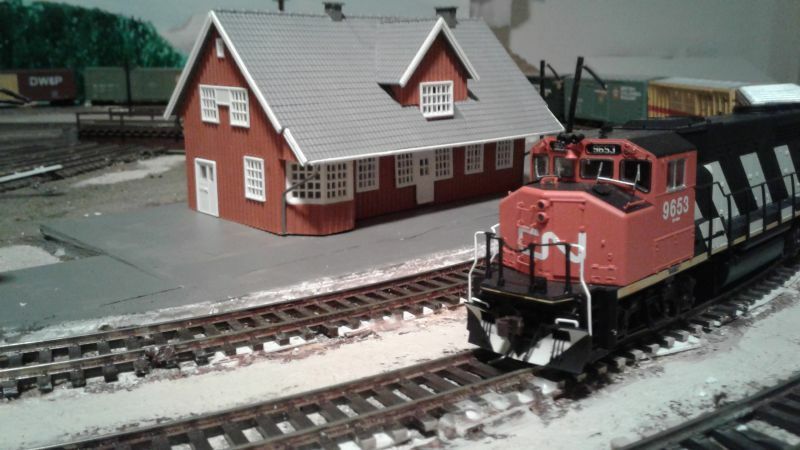 I must admit I am finding the testing of the trains and doing tasks related to the reconstruction quite therapeutic even if finding the issue with the derailment spots was a little frustrating and having the three controllers in action is also a bit of fun but I will be making sure that the fleet of locos and cars is as roadworthy as possible building up to it. The final view for now... hope this is contributing something among you! After a week or so, the second batch of trees arrived today including Spruce and Pines so a busy planting session tonight... well about 20 minutes anyway! I probably need a few more as Matt suggested... actually a lot more but there is a limit to what can be fitted into the location! 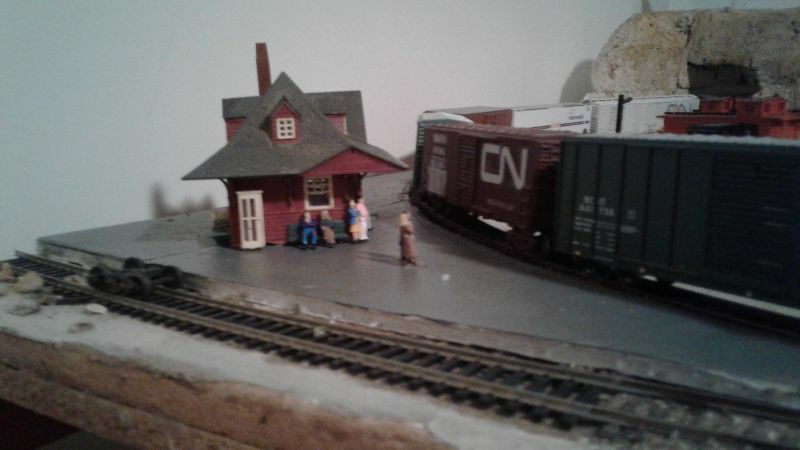 I have also been populating the station areas with the figurines that arrived last week. 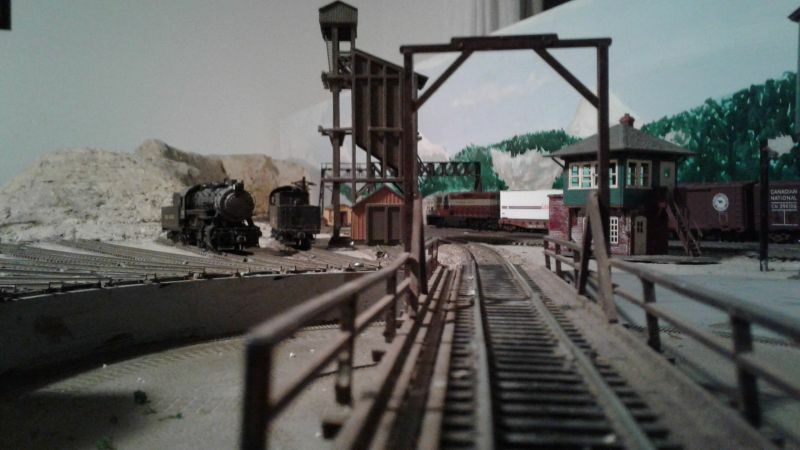 I have plenty left over for the Reginald Bridge branch when it gets done plus one or two for other spots on the layout! The testing has been pretty well done so when I get the ground cover fixed, I will set up for operations and away we go. 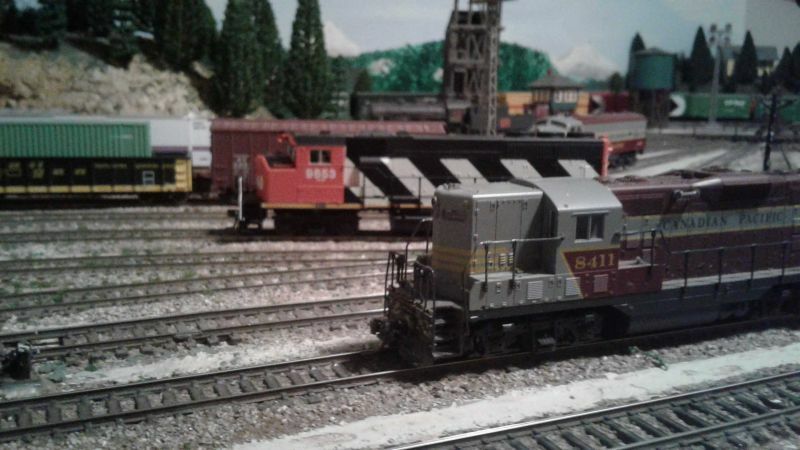 Entering the yard at "Ridgehaven". Normally this train would be crossing another to go "Westbound" but I am testing, not operating. 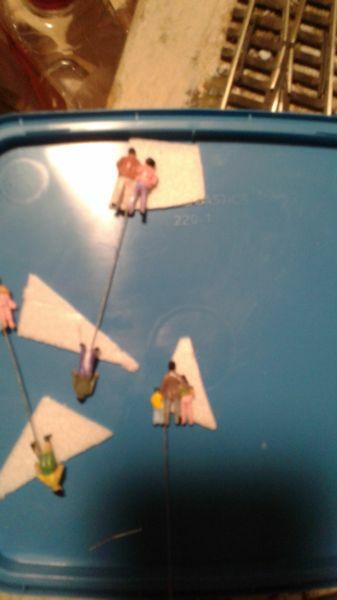 A little further down the track, and some of the figurines decorating the platform... they will be waiting a while for a passenger train! Hope you are enjoying the views! Thanks for the input Matt, appreciated. The testing phase is fairly right although I still have one stubborn are where the FP7 decides to no longer stay railed on fairly rare occasions now.. There was 20 minutes of running before the first wheel jumping the track occurred tonight but a little more correction to the track may have worked anyway. The annotying aspect is that is in the same area but no real cause can be found ... but it will be defeated! 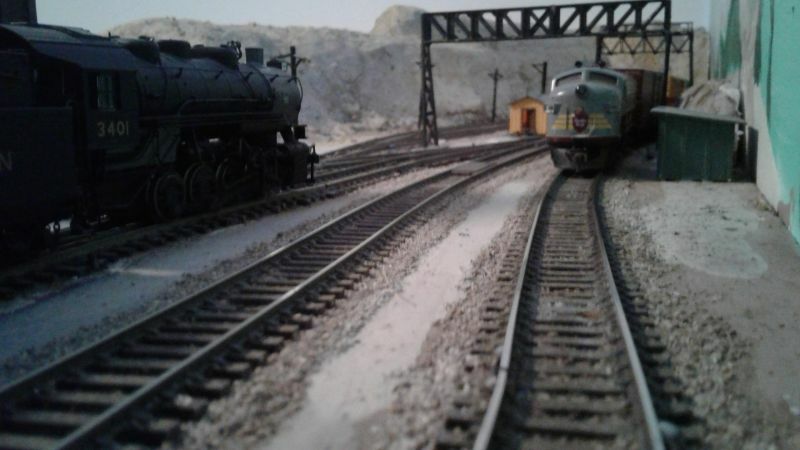 I will be putting more locos and stock on very soon when I get just a little more scenic stuff done. 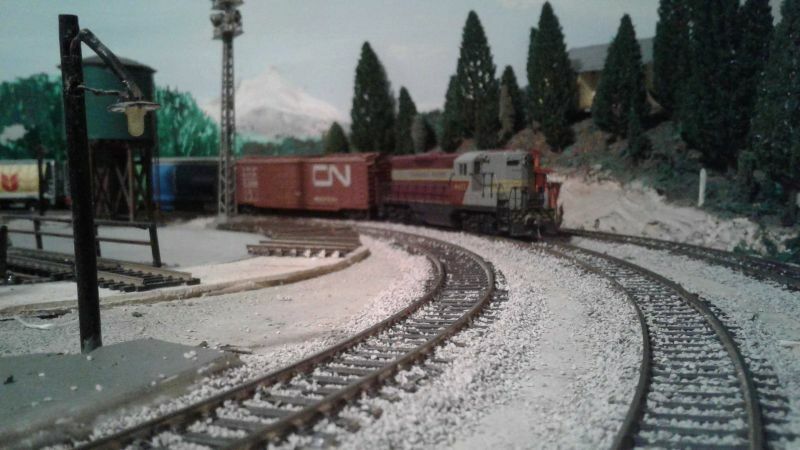 I am undecided as to getting more trees commercially or renovating the ones I do have and I want to get a little more ballasting and ground cover on... when I find all the stuff I own for it! Wetter weather has come into play here so a few more box searches are in order to whittle them down. Here are a couple of views taken tonight and one from the other night just to keep the interest up. Well that is it for now everyone... I will introduce a couple of other locos to the scene taking for future posts! My next day or two should hopefully get the backdrop better to merge into the front and the lights connected again! 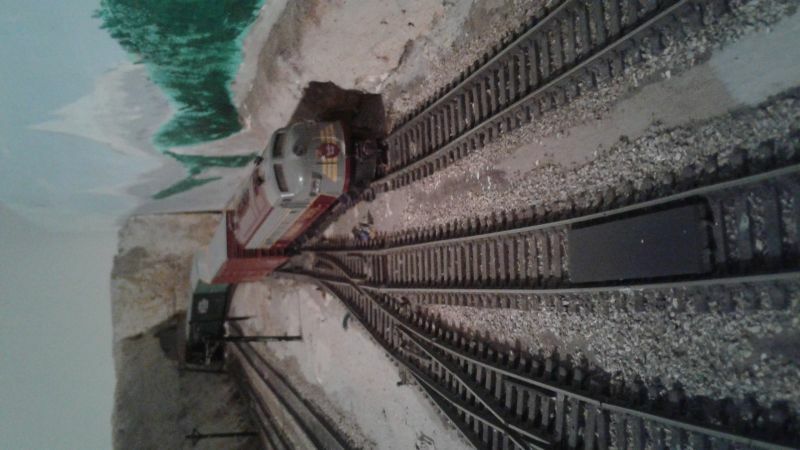 Busy the last couple of days with ballasting and updating the backdrop. Late last week the fourth batch of trees arrived where I bought 40 trees ... and it looks still thin by comparison to Matts movie shot. I had ground a lot of foam from florist blocks so I laid the backdrop board out on the porch and where the lighter green areas were, I laid out PVA glue and sprinkled ground foam on three different tones and went over it afterwards with diluted matt medium. Given how artistic I am (...not...) I am fairly pleased with the results. It has been a while because I have been in rehab re double knee replacement and not as much work has been done on the layout. 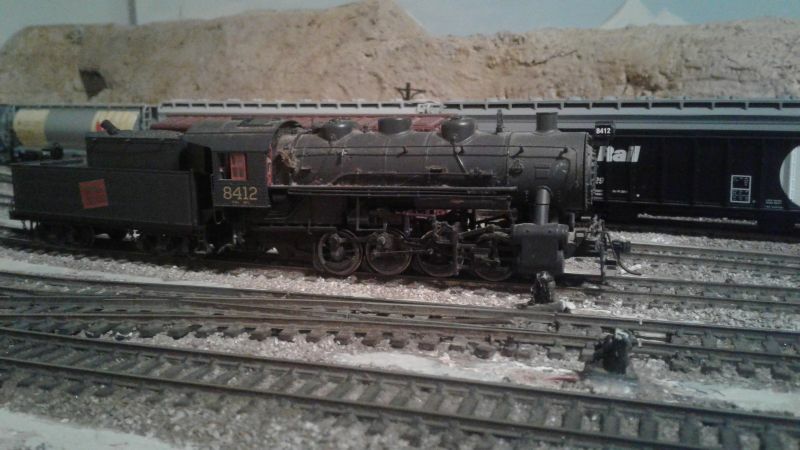 I would have been a bit further but for both my transistor throttles which seemed to go within a week of each other, first the walkaround version, then the mainline one which is still in bits as I am a fair way from the electronics store in Geelong. Plus there have been a few other setbacks so I have been planning a roundhouse for a little while longer than I had hoped. I had a little trouble with the verticals of the turntable side so they are removed for now but I will make some plastic sections to represent the front pieces. 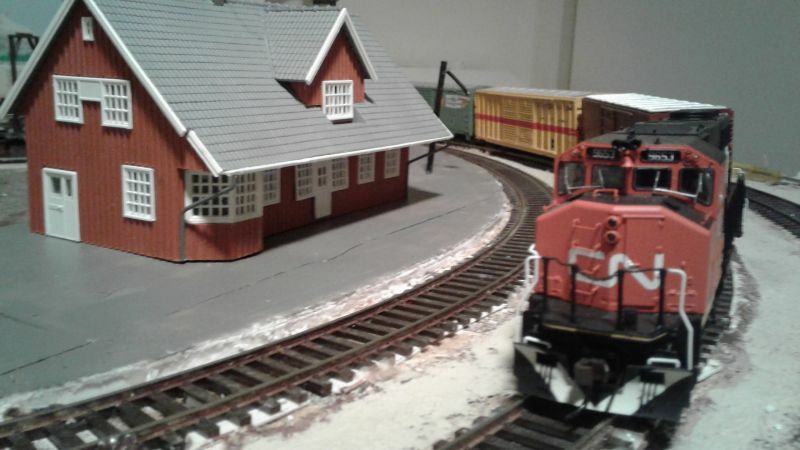 I was not game enough to alter the whole turntable roads so I have made the house fit the area rather than the other way around. The next step will be to use some Overhead transparency stuff to make the windows followed by an overlay to give it the rendered surface less the window openings, then a further overlay for the quoins (as we call them) for the relief on the sides. A bit more concrete decking is needed as well! Now I can start with the roof and start filling the loco yard to actually start operating ... after I have finished the "concrete" flooring ... same stuff as bedecks the station platforms! Hope the progress pix are a bit more frequent from here on... but I am only governed the same as the rest of us! Pleased to hear you are back on your feet after the knee operations. Backtracking to the 13th of June, the day before the operation, I received the last of the current batch of 50 trees so spent my last afternoon "intact" planting them. 50 Trees still did not get very much extra ground cover but it is slowly getting there! 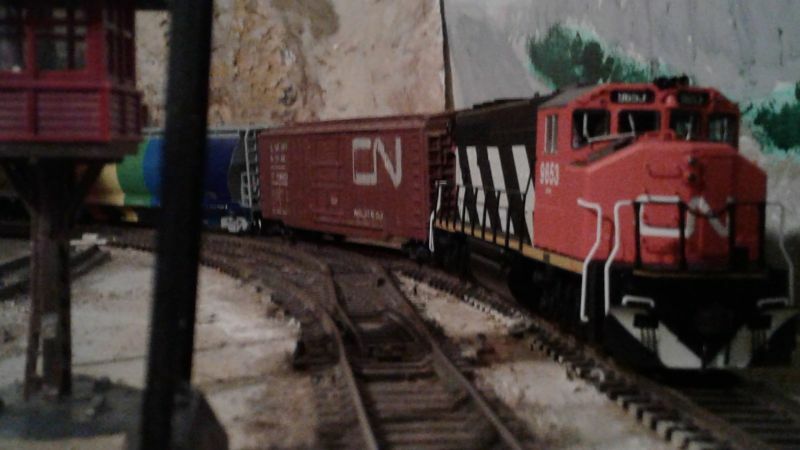 This GP38 arrived early last week but for some reason, Atlas locos seem a bit temperamental with new trackwork so I spent a bit of time test running and tweaking the track... again ... all my other locos were running flawlessly on the track. It now seems OK so till next time! As if I needed an excuse for a new loco! 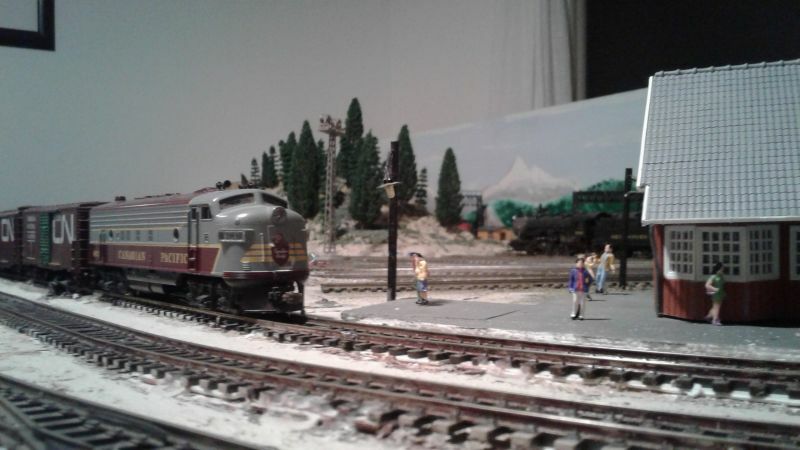 It does run very nicely as does the Loco facing it which was before Xmas! Another view of the spur hill ... now about another 500 trees and it might be as thick as Martins video suggests. The other "cutting" and hillside also has a few more trees, courtesy of the same packet.